3 Bedroom Detached House For Sale in Basildon for Price on Application. FEATURED IN THE BIG OPEN HOUSE EVENT - This unique double fronted property is oozing with character and comes to market with no onward chain. Built in the early 1900s this 3 bedroom detached family home is bursting with character and offers a wealth of style and many of the original features still in place throughout the home. Situated in the sought after Bowers Gifford location and perfectly located to transport links into London, with a mainline train station as well as the A13 or A127 all conveniently positioned to the property ideal for a commuter. With the town centre also just a few moments away offering a host of local shops, market and superstore for all your everyday needs. The property boasts 3 reception rooms with the lounge and dining room both offering stunning box bay windows creating a light and airy feel. The generous sized kitchen diner offers a large space for entertaining guests and comes complete with integrated appliances. To the first floor you have 3 sizable double bedrooms which is extremely rare on your average property so there's more than enough space for all the family with this home. The family bathroom offers a 4 piece suite perfect for any family of all ages. 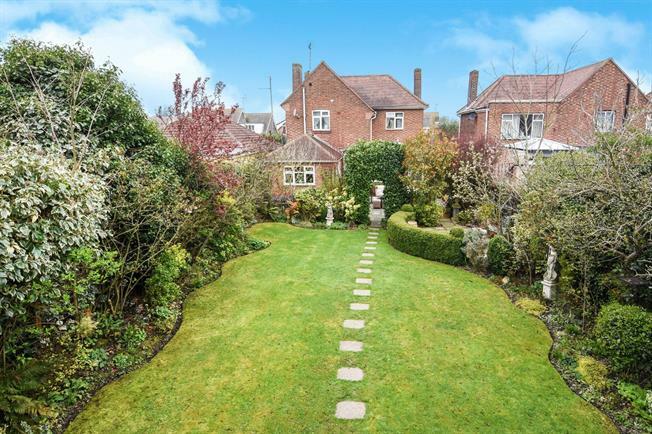 Externally the property features a larger than average rear garden boasting a patio area ideal for BBQ's, while to the rear of the garden there's a greenhouse and an outbuilding perfect for a workshop. You also have a generous sized storage space to the side of the property and off street parking for multiple vehicles to the front of the home. Double glazed bay window to the front aspect, a tastefully decorated room that is presented with wood flooring, skirting and coving with a meeting smooth ceiling, a feature cast iron fireplace, a range of power points, TV point and a radiator. Double glazed bay windows to the front aspect, presented in a very similar fashion to the living room with wooden flooring, skirting, smooth plastered walls and ceiling, coving, a feature fireplace, a range of power points and a radiator. Excellently presented with a ton of light, with windows to the rear and side aspect, French doors into the living room and opening out onto the garden, presented to wood flooring, skirting, a range of power points and superbly finished in keep with traditional style on the what was once the external wall. Wonderfully presented is this staggering kitchen/breakfast room with a range of wall and base level units, matching worktops with a Rangemaster oven and gas hobs with an extractor hood over. Tiled flooring, with under cupboard lighting and splashback tiles in selected places. Inset butler sink with a chrome bridge tap with integrated appliances, and a range of power points. Double glazed and obscured window to the side aspect, original tiled flooring to skirting, smooth plastered walls and ceiling, comprising a low level flush W.C and pedestal wash hand basin. Double glazed bay window to the front aspect with a beautifully fitted bay seat, double bedroom with carpeted flooring to skirting, feature fireplace, smooth plastered walls and ceiling to coving, a range of power points and radiator. Double glazed bay window to the front aspect with an accompanying window to the front aspect, carpeted flooring to skirting, smooth plastered walls and ceiling to coving, a feature fireplace with fitted wardrobes. There's a range of power points, and a radiator. Double glazed window to the side aspect, presented to carpeted flooring and skirting, smooth plastered walls and ceiling with coving, large enough for a double bed, a range of power points and radiator. Double glazed and obscured window to the rear aspect, beautifully presented comprising a free-standing roll top bath, separate shower cubicle, wash hand basin with vanity unit and cabinet, with a low level flush W.C.